What’s My True Agenda? | Muse Me, Mama! No, nothing quite so drastic. I’m taking a step back to look at this from two standpoints: the Practical and the Divine. Cozi.com – My latest find: an online family organization tool + phone app. Finally something simple that lets me put in and color code family member activities. Workflowy.com – This is my bare bones to-do list tool. No bells and whistles makes it super easy to manage. Just dump all your to-do’s into an outline format here and get the satisfaction of crossing them off as you finish. I like the Twitter-esque hashtag feature too. I’m still working to find the best ways to help my daughters become more effective in doing what they need to do – with limited whining and complaining. But at least I am getting a better handle on myself. My latest goal (ok, let’s face it – this has been a goal for a LONG time) is to make time for me, to exercise, have friends, and write. Getting there. That’s all I can ask right now. And now, the Divine. I know my laundry list of to-do’s pales in comparison to what God wants from me. So I am trying intently to listen and honor it when I hear the Voice whisper inside. 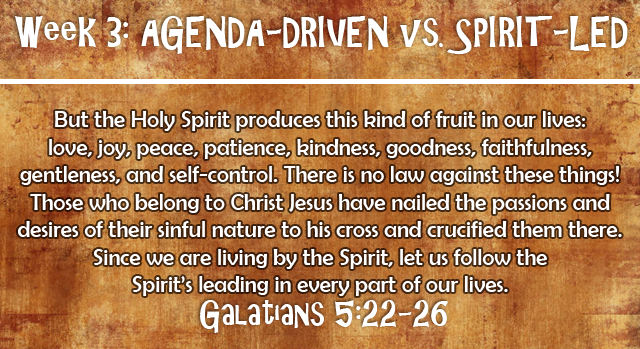 Look at what living by the Spirit brings into your life! Couldn’t we all use more of that?! And so I need to acknowledge that my agenda is not supreme. My to-do list will live another day without being done. My true agenda needs to be one of listening first, allowing myself to be led by Spirit. Sometimes that means following my agenda but sometimes I will be led somewhere altogether different. Like yesterday for example, when I planned to spend the afternoon working my way through the never-ending loads of laundry. God had a different plan. He whispered “Play.” My littlest needed me. I offered to play Legos with her and her look of surprise and disbelief nearly floored me. Do I really play so rarely? We dumped out that barrel and played together on the floor for a long time. I set aside all those to-do’s and you know what? I haven’t given a single thought to what I didn’t do, and I can’t stop thinking about what I DID do. Legos. Love and joy. Gratitude.